No matter what your issue might be, our goal is to make the solution as simple as possible for you. From basic repairs to panel upgrades, from your outlet to rewiring an entire room or remodel, our team of licensed electricians is dedicated to helping you keep your home fully operational. Contact us today for any electrical repairs in your home. You usually do not take stock of the power running through your home. However, when there are problems, your electrical system becomes hazardous. Making repairs to your electrical wiring requires the assistance of a professional and certified electrician. That’s why, at QCA Electric, we offer complete electrical solutions for your home as well as your business. From replacing damaged outlets to inspecting the quality of your wires, you can trust our team to perform a full and accurate diagnostic and repair. Our licensed electricians are all trained on the National Electrical Code, and ensure that your home meets the outlined standards. This assures that your home’s electrical system is both functional and safe to use. Reach out to our office to discuss your home’s electrical system with us and allow our team to keep you and your family safe. Whether you are building a new home that needs full wiring and setup, or you need a new light installed, our team has you covered. Our electricians have the experience and equipment to handle any electrical installation no matter the size. 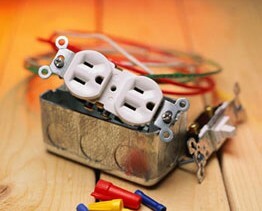 We also take care of supplemental electrical systems such as a home generator installation. Additionally, if you live in a historic home, your wiring might be a little worse for wear. Our team can update the entire system to ensure it meets today’s standards. To learn more about the installation services we offer, give us a call; our team is always happy to answer your questions and take care of your electrical needs. There are a number of amenities for your home that are outside and need power. From hot tubs and pools to decorative landscape lighting, all of these require a connection to your home’s power grid. When installing electrical connections outside, our electricians take special precautions to ensure your system is safe from faults. We use wiring that is protected from the elements, so it is safe to use outside. This ensures all of your outdoor devices work no matter what the weather is. Reach out to our team to learn more about our outdoor electrical installations. Contact us when you need electrical work performed on your home. We proudly serve Bettendorf, IA, and the surrounding areas.